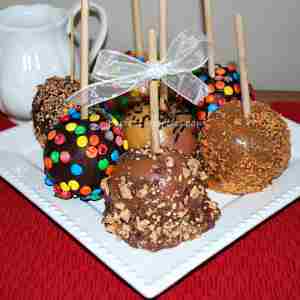 Apples dipped in chocolate or caramel and sprinkled with yummy candy treats make this one a delicious treat. Wrap individually with a bow and it also makes a great party favor to take home. For favors add a tag with a birthday note. Melt chocolate in a chocolate melter according to directions or caramels on the stove top or microwave. Dip and twist to coat. Use a spoon if need to cover entire apple. Let excess drip into pot. Place on waxed paper or parchment paper. Refrigerate until toppings and coating sets. 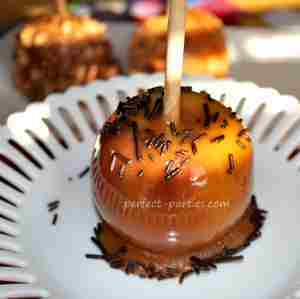 Caramel hardens relatively quickly in the pot so work relatively quick. Do not remelt it changes the consistency. Chocolate needs about 30 seconds to cool before adding treats or they may slide. After you add sprinkles or candies, put in refrigerator to set. I used small dishes and placed them in the refrigerator to set as soon as each was made. I lined the plate with a small piece of parchment paper.